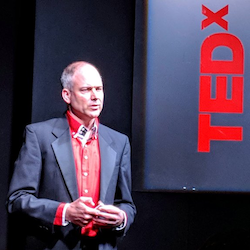 To generate funds to help support the work of the social enterprise Innovate Malvern, founding Managing Director Dr Adrian Burden gives fee-paid lectures, talks and speeches at corporate events about technology innovation and entrepreneurship. 26 categories of innovation where we've changed the world around us: the way we do business; the way we use resources; the way we live. What are some of our greatest achievements, what have we learnt, and how can we improve on them yet further? This talk is a whistle-stop tour of human creativity to cross the disciplines and expand the mind. Standing Innovation - should we applaud our creativity or brace ourselves? The Human Race has been creatively solving problems since the Stone Age, but the feeling is that it is happening at an ever increasing pace to the extent that we may no longer be able to keep up. Should we celebrate our collective innovations as a job well done? Looking at the state of the world around us, have we been creative enough? And what is coming next that could disrupt our lives yet further? Can we even confidently extrapolate into the future? This talk is an exploratory and hopefully thought-provoking journey through some of the scientific, technological and business innovations that we have witnessed through the ages with a view to what we might see in the future. What's it really like to invent a new technology, spin-off a company, raise venture finance, secure a first customer, expand overseas and then exit the business through a trade sale? There are lots of balls to keep in the air: patents to file, products to prototype, sales to generate, cash flow to monitor and staff to recruit. Some things go well, other things go spectacularly wrong and there are plenty of near misses along the way. This talk details some of Adrian's experience as the founding CEO of a high technology start-up in Singapore that was spun out of a research institute, expanded into Europe, won numerous prizes, and was later sold for millions to a multinational company headquartered in India. Based in part on his recent book Start to exit: How to maximize the value in your start-up . Please get in touch if you'd like Adrian to speak at your next corporate event. He can tailor his talk to suit your programme, the time available, and the audience. The standard fee is £975 (excluding VAT, travel and susbsistence) for a talk, speech, or lecture of up to an hour in length. And moreover this money helps Innovate Malvern stage its various events in the community.